Francine’s Friends was awarded the Dr. Bernard Stuart Health Award given each year by the local Fort Wayne Chapter of the NAACP. The Dr Bernard Stuart Health Award honors local organizations or individuals whose efforts improve the health of the African-American community in Fort Wayne. The award was given this year at the annual Freedom Fund Dinner on Saturday, August 20. The event was held at the Mirro Center and featured remarks by Mr. Larry Gist, the President of the local chapter and Ms. Barbara Bolling, Indiana State President of the NAACP. “We are very humbled and honored to be presented with the health award from the NAACP this year,” said Sharon Simmons, co-founder and board president of Francine’s Friends. “In our twelve years of funding screenings, our mission has been to improve the health of women in our community through early detection and by making screening mammography accessible to those who may be unable to otherwise receive this potentially lifesaving screening,” she continued. “We thank the NAACP for their confidence in our ability and their support of our mission,” she concluded. 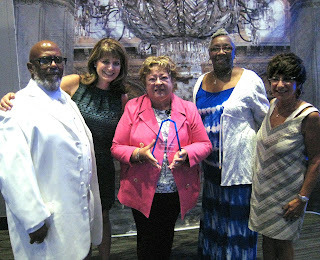 Shown from left to right: Larry Gist (NAACP Chapter President), Betsy Didier (Francine’s Friends board member), Sharon Simmons (Francine’s Friends co-founder and board president), Gail Littlejohn (award presenter). and Sharon Eisbart (Francine’s Friends co-founder and board member).